Pneumoperitoneum. Classic surgical and emergency teaching suggests that pneumoperitoneum is diagnostic for a perforated hollow viscus and is therefore a surgical emergency. This dictum, however, is accurate in only 85% to 95% of cases.1 Although infrequent, there are nonsurgical causes of pneumoperitoneum (Table 1). Presented here is a case of nonsurgical pneumoperitoneum that resulted from mechanical ventilation induced barotrauma. Pneumoperitoneum from cardiopulmonary resuscitation, mechanical ventilation, and tracheal rupture has been recognized in literature since the early 1940’s.1 Current retrospective analysis estimates the incidence of mechanical ventilation induced pneumoperitoneum to be as high as 7%.2 The mechanism for which air in the thorax traverses the abdominal cavity is still under investigation. 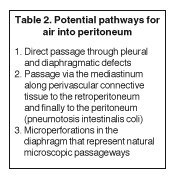 However, there are 3 proposed pathways (Table 2). In a nonacute setting, when signs of sepsis or peritonitis are absent and when clinical suspicion for a ruptured viscus is low, management strategies for pneumoperitoneum can be conservative. Repeat follow-up radiologic examination can be performed and the patient monitored until the pneumoperitoneum resolves. However, as the largest cause of nonsurgical pneumoperitoneum is mechanical ventilation;1 the majority of patients are not only intubated but are usually sedated. 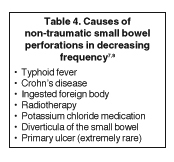 Furthermore, they frequently have confounding factors, such as high dose steroid use or immunosuppression, which can obscure both the laboratory and clinical signs of perforation leading to peritonitis and sepsis.3 These critically ill patients are the least tolerant of surgical intervention. Therefore, given the possibility of inaccuracy that comes with the clinical exam in a mechanically ventilated patient, alternative means of detecting the surgical emergency of pneumoperitoneum must be considered. 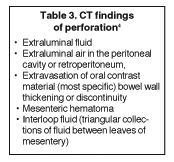 Once pneumoperitoneum is discovered on CT, the search for a source of perforation ensues. 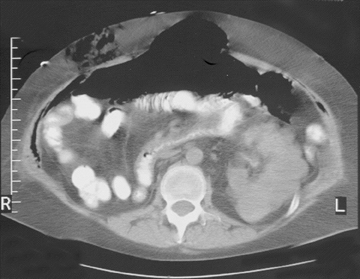 The most accurate evidence of an oral-contrast CT for perforation of a hollow abdominal organ requiring surgery is the extravasation of contrast and/or free intra-abdominal fluid, not the presence of intraperitoneal air.4 In cases of pneumoperitoneum with CT findings of intra-peritoneal fluid or extravasation of contrast, the decision for operative intervention is clear. As seen in this case, however, only intraperitoneal air without additional evidence of perforation should lead the physician to consider nonsurgical causes of pneumoperitoneum. Factors, such as patient history, previous surgeries, concurrent medical conditions, and course of events, must be evaluated prior to determining the cause of free air and subsequently the need for operative intervention versus observation and supportive care. 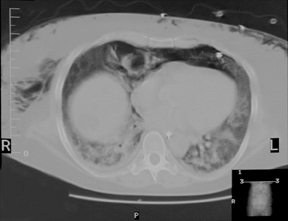 In the sole presence of intraperitoneal air, concurrent CT findings of ventilation induced barotrauma, such as pneumothoraces, pneumomediastinum, or subcutaneous emphysema, strengthens the argument for observation.3 Although there is currently no predictive correlation between the incidence of computed tomography findings of barotrauma and the occurrence of nonsurgical pneumoperitoneum, these findings should be used as a retrospective tool to direct the physician to consider a nonsurgical cause of the pneumoperitoneum. Henry RE, Ali N, Banks T, Dais KA, Gooray DA. Pneumoperitoneum associated with mechanical ventilation. J Natl Med Assoc. 1986;78:539-541. Grassi R, Pinto A, Rossi G, Rotondo A. Conventional plain-film radiology, ultrasonography and CT in jejuno-ileal perforation. Acta Radiol. 1998;39:52-56. Greenstein AJ, Mann D, Sachar DB, Aufses AH Jr. Free perforation in Crohn’s disease: A survey of 99 cases. Am J. Gastroenterol. 1985;80:682-689.